Diaoyu Islands Are China’s Inherent Territory, history proves. No doubt, the islands have historically been a part of China’s territory. The Diaoyu Islands appeared on China’s map since the Ming Dynasty of China. Read the article and you’ll see. China has reiterated many times that the Diaoyu Islands have been China’s inherent territory since ancient times. The Diaoyu Islands, in the East China Sea between China and Japan, have belonged to China since ancient times. The islands include some small islands and reefs, with the Diaoyu Island the largest one covering an area of five square kilometers. No one can live there due to the lack of fresh water. The islands are 120 nautical miles northeast of Taiwan, 200 nautical miles west of China’s mainland and 200 nautical miles east of Japan’s southernmost island Okinawa. Geologically the islands are attached to Taiwan. The waters around the islands are 100 to 150 meters deep and there is a 2,000-meter-deep oceanic trench between the islands and Japan’s Okinawa islands. Fishermen from China’s Taiwan and Fujian and other provinces conducted activities such as fishing and collecting herbs in this area since ancient times. The islands appeared on China’s map since the Ming Dynasty (1368-1644). There are records about the islands in a book published during the rule of Yong Le (1403 to 1424) in the Ming Dynasty, more than 400 years before Japan claimed discovery of the Diaoyu islands in 1884. After the Ming Dynasty, the islands were recorded in many historical documents. On a map published by Japan between 1783 and 1785, marking the boundary of the Ryukyu Kingdom, the Diaoyu islands were shown as belonging to China. Japan never questioned China’s sovereignty over the islands before the Sino-Japanese war of 1894-1895. In April 1895, the government of the Qing Dynasty was forced to sign the Treaty of Shimonoseki, under which China ceded the whole island of Taiwan and its surrounding islands including the Penghu Islands to Japan. 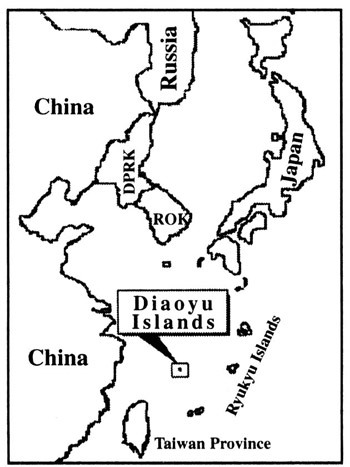 Only since then has Japan had its own name for the area where the Diaoyu islands are located. Before that, Japanese maps marked the islands by their Chinese names. Japan was occupied by the United Sates after it was defeated in the Second World War. In 1951, Japan and the United States illegally signed a treaty in San Francisco without the presence of China, which was one of the victor countries in the Second World War. Although article two of the treaty said that Japan surrendered its claim over Taiwan and the Penghu islands, article three wrongly assigned the Diaoyu islands, which Japan had stolen from China, and other islands, to the Ryukyu zone which was under U.S. control. The then Chinese Premier Zhou Enlai lodged a strong protest and said the Chinese government would never recognize the San Francisco Treaty. In a statement on territorial waters in 1958, the Chinese government said that Japan should return all the territory of the People’s Republic of China including Taiwan and the islands around it to China. Consequently, there is no room for argument that the Diaoyu islands have historically been a part of China’s territory. The issue of the Diaoyu Islands once served as an obstacle to the normalization of Sino-Japanese relations and the conclusion of the Sino-Japanese Treaty of Peace and Friendship. Taking into consideration the overall interest to develop Sino-Japanese friendship, the then Chinese and Japanese governments agreed to settle the issue in the future. However, the Japanese side has broken its promises repeatedly and has provoked incidents one after another in recent years in an attempt to seize the islands. Hi man, Diaoyu Islands are China’s inherent territory, aren’t they?